"Critters in the Forest" Lawn Fawn Sneak Peek! Happy Monday everyone!! I hope that you had a wonderful Sunday! Mine was fabulous! I had an engagement session with one of the cutest couples in the world, and it was an awesome time! I can already tell that I am going to have such a hard time whittling down their gallery to just the very best shots. They are so photogenic and in love...I love that! Instructions: Fold cream cardstock in half to make card base. Cut cloud paper slightly smaller than the card front, round the corners and ink the edges. Freehand cut a strip of green patterned paper to make the ground, round the bottom corners, and ink the edges. Adhere the green paper to the bottom of the cloud block, and adhere to the card front. Stamp the tree to kraft cardstock and green patterned papers. Cut out the necessary layers, adhere them together, and add to the right side of the card. Stamp the log to kraft cardstock and the leaves to green paper. Cut out, layer together, and adhere to the right side of the card. 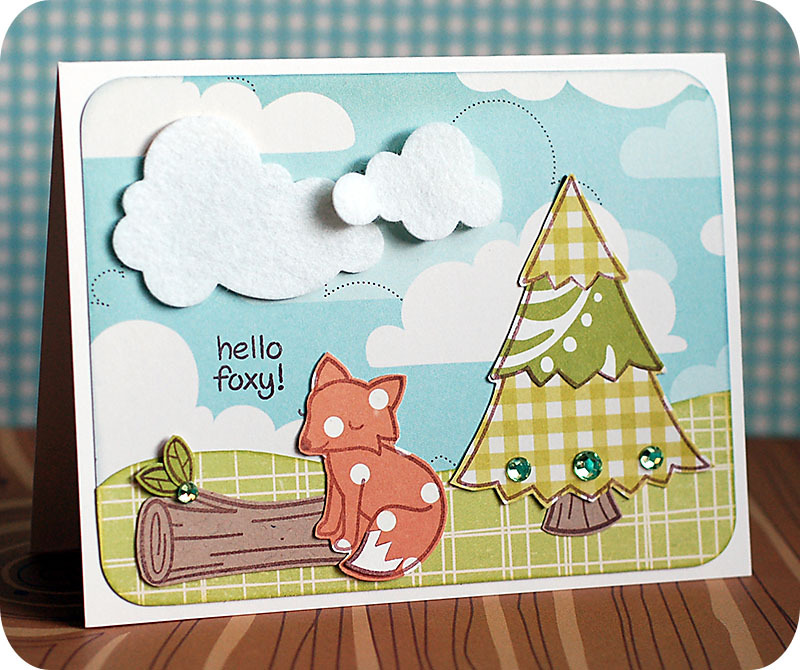 Stamp the fox directly to the card front, and then to orange dot paper and cream cardstock. Cut out, layer together, and adhere to the top of the already stamped image on the card. Cut the clouds from cream felt using the Cuttlebug. Adhere both to the top of the card, popping the smaller one with foam adhesive. Stamp the sentiment directly to the card front by the fox, and then accent with green jewels to finish. Sigh...I just love this whimsical little scene...it is so darling!! I know that I can't wait to see what the other Lawn Fawn girls came up with...and here is a list so you can check them out too! Nichol Magouirk- March Guest Designer!! Lea, this is soooo sweet!!! I just love everything - all that paper pieced goodness :-) I can't wait to get this stamp set now!! It's a really nice card and what a creative way of doing it. Good for those who don't have copics or colors. Cute card! Great job paper piecing, and I love the added bling on the tree and log. Great JOB! This is so cute! I love the little scene and the felt clouds! Oh my goodness, Lea, I *love* your happy card! :o) Love all of the patterns you used, and the little leaves with the gem? TOO adorable! WPlus9 April Release Day 4: "Filigreed Frames"
WPlus9 April Release Day 3: "Filigreed Frames"
WPlus9 April Release Day 2: "A Special Lady"
WPlus9 April Release Day 1: "A Special Lady"
Office Mini Cards + an Announcement!! Stamper's Dream Blog Hop with JustRite!! "Plus One" Lawn Fawn Sneak Peek! "Say Cheese/Say Cheese too" Lawn Fawn Sneak Peek!